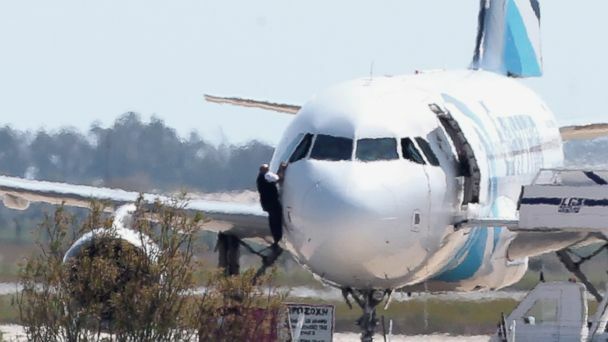 The hijacking of an EgyptAir flight came to an end today after all passengers and crew members were freed and a man believed to be responsible was arrested at an airport in Cyprus. The suspected hijacker had initially released all but seven passengers and members of the crew after he diverted the flight. Officials had said before the standoff ended that the captain, his co-pilot, a flight attendant, security guard and three passengers were still on board. While negotiations were ongoing, three people were seen walking off the plane and a fourth was seen climbing out the cockpit window. The suspect was then arrested and everyone was freed on the European island nation. Cyprus President Nicos Anastasiades said the incident was not terror-related. "It's not something which has to do with terrorism," he said. The Foreign Ministry of Cyprus tweeted the name of the suspected hijacker as Seif Eldin Mustafa. The hijacker had a "suicide vest" that contained no explosives -- just cellphone cases made to look like a suicide belt, according to the Cyprus Foreign Ministry. The hijacker had wanted to fly to Istanbul, but the plane did not have enough fuel so he opted for Larnaca International Airport in Cyprus, ministry spokeswoman Margarita Kiriakou said. When the plane landed there, the suspected hijacker initially released everyone but the seven people. The hijacker decided on his own whom to release, Kiriakou said. Flight 181 was headed from Borg El-Arab Airport in Alexandria to Cairo Airport when it was diverted to Larnaca International Airport in Cyprus during the hijacking. The plane took off just before 6:30 a.m. local. The aircraft landed safely at Larnaca at 7:50 a.m.
A statement from the Egyptian aviation authority said the flight had 55 passengers aboard in addition to crew members. The U.S. Embassy in Cyprus says it is looking into whether any U.S. citizens are involved.